Knowing what to write in a thank you card can be tricky. Sending a card to express your gratitude is a warmhearted and kind gesture. It doesn’t take a lot of effort, nor does it have to be extravagant, but the time you put into a thank you card can reflect and represent the appreciation you have for someone. Be that for their thoughtful actions, words or support. But what to write? How to get those feelings you have and turn them into words? If you’re struggling to get past “thanks” or “thanks very much” then perhaps we can help. 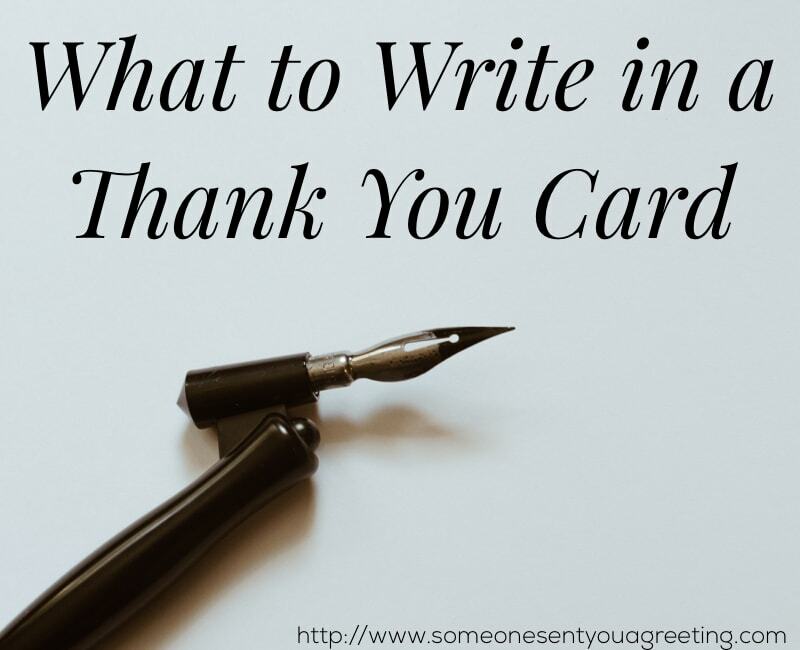 This guide on what to write in a thank you card should help give you all you need for the perfecto note or message. We’ll take you through the different steps to writing your message as well as some handy examples you can copy if you need to. Whatever you choose to write though make sure it’s genuine and comes from the heart. If you stick to that then whichever words you use will be warmly Received and appreciated. 1.1 What is it for? 1.3 What did you like about it? 1.4 How did it make you feel? If you’re planning to write your own thank you message, as opposed to using a pre written one like the examples further below, there are some steps you can follow. This should ensure you cover all the bases and say everything you would want. In order to thank someone properly you will of course need to know what you’re thanking them for. It could be a birthday or wedding gift, someone who was there for you during tough times, a service provided that was outstanding, or no particular reason other than you just wanted to thank someone for being generally great. Whatever it is it will shape how you write your note. So before you even pick up a pen or sit at a keyboard get in mind what it’s for. Begin your note by taking whatever it is your thankful for and telling the recipient your thankful for it. It doesn’t have to be outlandish or extravagant, just a simple thank you to show your appreciation for their generosity. I just wanted to thank you for your constant friendship. The next step is to let the recipient know what you liked most about the gift/service/help etc. If they’ve supported you or been there when you needed them most then say just that. Be honest and say how much it meant to you. If it was a gift then detail why it was such a good gift – had you wanted it for while, was it practical or indulgent? Let them know what you plan to do with it. Compliment them on their gift giving skills if you wish. If the service at your favourite restaurant was excellent then say how and why. Maybe mention a specific member of staff if you can. Don’t feel the need to be too cool. Express your emotions, tell them why the gift was so great or how their support was needed at that time. The more honest the better as it will help the note to sound genuine. They will also appreciate hearing the fact that they’ve had such an impact on your life. Knowing there was someone out there thinking of me and able to talk to was so important. I don’t want to get too sentimental but your friendship means so much to me. This is the final part before signing your card. Make it personal to them and in relation to the rest of the message so far. Sign your card with a greeting or thank you and then include your signature. Thank you for the lovely gift. It was such a surprise! I absolutely loved the luggage you got me and will be using it on my next vacation. I was really touched by your kindness and generosity. I’m really grateful for your support when I was feeling down. I was really struggling and having someone to talk to was exactly what I needed. Knowing there was someone out there thinking of me and able to talk to was so important. If you ever need someone to talk to then don’t hesitate to call. Please accept my thanks for your wonderful service. My family and I were treated exceptionally. The staff went above and beyond to make us feel welcomed. It was a special occasion for us as a family so to have such great service really made all the difference. I will be recommending you to all my friends. Whilst there aren’t any standard rules to stick to there are a few things you might want to consider. Try to send your card promptly. If possible do it directly after the event (gift received, service provided etc). If you can’t then a week or two is acceptable. Even if you feel you’re late then send it any way. It’s better to send a late thank you card than not at all! Be neat with your message. Keep your handwriting as clear as possible and try to use black or blue ink. Handwriting it is also much more personal than typing it on the computer. Use a nice envelope and write a clear address. It doesn’t have to be fancy but make it smart and legible. If instead of writing your own you’d rather use some ore written examples then read on as we have a large selection. If you just want a very quick sentence to sum up your feelings, or if your card came with a pre written sentiment, these short messages will be perfect. You will no doubt want to send a thank you card for any gifts you receive. If someone took the time to buy and give you a birthday gift then it’s only right to thank them for thinking of you. My birthday was made all the more sweeter with your fantastic gift. Thanks! My gift was perfect! Thanks so much! One of the most popular reasons to send a thank you card is in reply to a wedding, newborn baby, graduation etc. Gifts and attendance at big events like this are common and it’s polite to thank people for their generosity or just for coming to the celebration. I can’t believe I’ve graduated! It was amazing you could make it and the gift was perfect. Thanks! Thank you for the generous baby shower gift. It will be so useful. Thanks for my wonderful retirement gift. It’ll be perfect for all the free time I have now! The snugglie you got for Sam was adorable! It’s perfect and I can’t wait for you to see him in it. Thanks! If you’re writing lots of thank you notes in reply to a big event (like a wedding, for example) then it’s a good idea to stick to a tried and tested formula. Although you don’t want your messages to sound scripted or robotic, using a good template to save time for most of them is fine. You may want to thank someone if they have been a real help to you in a time of need. That can range from something more mundane like looking after your pets or watering your plants through to major support during a really difficult time. We really appreciated you being the for us in such challenging times. When I can I’m going to find a way to repay you for all the help. Thanks! It’s during the most testing times you find out who your true friends are. And you are a true, true friend. Thank you so much. This could just be a simple thank you for ongoing friendship or reminiscing about special times with someone. Letting a friend know you care or appreciate them without necessarily having a reason might seem odd, but an act of kindness that comes out of the blue will be very well received. Not all thank you’s have to be in response to something. We’ve had so many good times together I’ve lost count. I can’t imagine anyone else like you. Thanks for the fun! Very little means as much to me as you. Friends forever! If everything you write feels awkward don’t be deterred. Many people feel this and it’s not uncommon. The best way combat this is to try and write exactly as you would speak. Don’t attempt to sound more fancy than is needed. Writing as you speak will give your words more honesty and sound genuine, even more so as people will recognise your voice in the writing. Have you had some outstanding service somewhere? Did a restaurant make you especially welcome, or maybe an airline moved you to business class? Did a company help you with your nervous child? Anything whereby you felt the service you received went beyond the normal deserves a thank you note.